Just coming up for air to let you now that this is what I am up to most of the time. I gyrate a lot. I gyrate like an item number on acid. 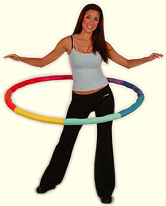 I can do this without losing the hoop for about 5 minutes at a stretch ONE WAY. (You have to hula in both directions for optimal effect). The veterans can hoop through an entire episode of Desperate Housewives. I have welts and bruises all around my waist, and I hurt in ways I did not know was possible. This is all good because I know now that under all the blubber my abs were still holding out for me. THEY STILL WANT ME, PEEPULS. It was never over, that brief love affair. I love it and I am already dreaming of a notion of a waistline again – setting the bar low, see? As if I wasn’t addicted enough, I set it to music. This track. What was I thinking? Now between the hooping and the Zumba (ZUMBAAAAAA! ), the Viking will have to sedate me soon. Or he could just take advantage of me in disgraceful ways and completely rumple my honour. You exist to make me feel awful. Was the sun overshadowed by evil forces when I decided to strap you on today? I was hopeful today, you awful piece of junk. And hope is fragile. But what would you know? You inform me that I have walked 500 steps today. 500? You must be broken. Oprah needs me to do 10,000. We have a pact, you heartless device. I knew those extended tea breaks would kill the game. That and the blogging. How will my world continue to spin on its axis if I’ve disappointed Oprah? Answer that, pedometer. Measure my heartache.